A celebrated singer and songwriter, Alejandro Escovedo has as eclectic a background and body of work as any rock artist of his generation. As comfortable performing with a string ensemble as he is with an amped-up power trio, and as likely to bare his soul in his lyrics as he is to lay out some serious rock & roll swagger, Escovedo had already played an important role in punk (with the Nuns), roots rock (the True Believers), and alt-country (Rank & File) before he launched a solo career that’s seen him work with everyone from John Cale to Bruce Springsteen. Beginning with 1992’s Gravity, Escovedo’s music has been literate, ambitious, and eclectic, with many of his best albums — 1996’s With These Hands, 2001’s A Man Under the Influence, and 2006’s The Boxing Mirror — exploring different genres and approaches from track to track, while his albums with producers Tony Visconti (2008’s Real Animal, 2010’s Street Songs of Love) and Peter Buck & Scott McCaughey (2016’s Burn Something Beautiful) helped him focus on passionate, guitar-based rock & roll. The son of Mexican immigrants to Texas, Escovedo is from a family that includes several professional musicians, including his brothers (and percussionists) Coke Escovedo and Pete Escovedo, and Sheila E. (Pete’s daughter and Alejandro’s niece). Alejandro’s brother Mario fronted the hard rock band the Dragons, and another brother, Javier, was in the punk rock band the Zeros. A recent tour of Europe found Escovedo sharing stages with the Italian rock band Don Antonio, and Escovedo struck up a friendship with the group’s leader, Antonio Gramentiere. The two collaborated on a set of songs about two young men — one from Italy, one from Mexico — who come to America to follow their dreams. 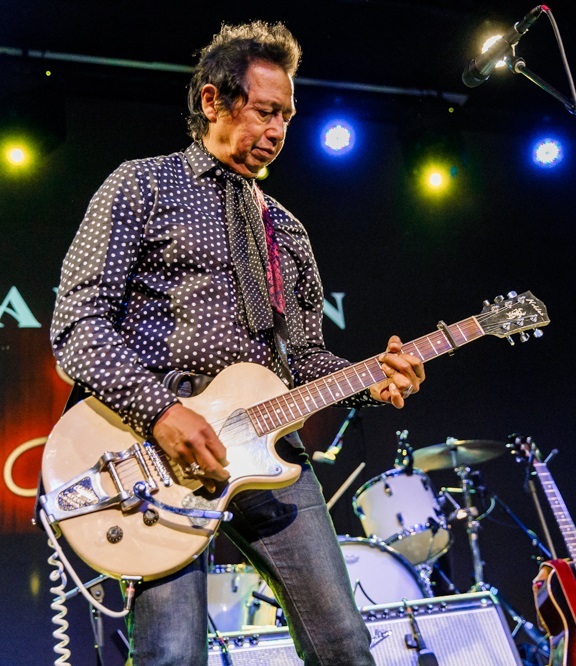 Escovedo recorded the songs on his 2018 album The Crossing; Don Antonio served as his backing band for the sessions, with guest appearances from Wayne Kramer of the MC5, James Williamson of Iggy and the Stooges, and Peter Perrett of the Only Ones. Crossing borders, jumping barriers, taking risks, betting it all: that’s the path Alejandro Escovedo has been taking in his lifelong search for the heart of rock and roll. His newest album, an epic 17 song suite “The Crossing” is about that journey: searching, but not necessarily finding, eyes and ears open all the way. Ranging from sweeping orchestral numbers to classic rock to bursts of 70s punk, the collection finds Escovedo delving further into his lifelong musical journey across his most sonically diverse work yet. Escovedo appears with his full band and a special guest!